I'm quoted this week in an article in Automotive News regarding mobile paid search ads. Mobile advertising is an extremely complex area right now. There is more that needs to be learned as Google changes their marketplace. They are making the right moves as a business. Now it is up to us to provide the best value for our customers. Pricing on mobile is up significantly since the change to Enhanced Campaigns. However, it is still a great value for the local business. In addition to Mobile Paid Search, I'm really interested in where the mobile display space is going. It is really hard to Mobile Display, for a consumer that is in-market to buy a car, at the local level. Easy if you are doing a one-off buy. Hard to do it for small budgets (sub-$1000) at scale (1000's of advertisers). We will figure this out. Link to the Automotive News Article (you have to be a subscriber unfortunately). I recently bought a new set of tires from Tirerack.com. I wanted a specific kind that got good ratings. They were delivered to my house. I had to find a place to get the tires mounted. I called the local Les Schwab. It was close by, and they pride themselves on service in their ads. I called them, and they quoted me a price, but i couldn't make an appointment. So the next day I took the car in mid-day figuring it would be a 30 minute install. They told me they were busy that day and could I leave my car with them for the day. I couldn't. They, in turn, recommended I come back first thing the next day. Next day, same thing. A 3 hour wait. Now, they were very friendly. But being friendly isn't good enough now. We are seeing a change in how service is conducted. "Good" isn't good enough now. Why can't a make an appointment? Why can't I make an appointment online? I should have an exact appointment where they meet me in the service drive. If you can't do a good job of being exact about timing, why don't you provide a car service so I don't have to sit in your waiting room for 3 hours? Services has to get "Great" for it to break through the norm. Look at Uber. Uber is a new "taxi" service. You use an app to request the towncar. App shows you how long it will be until it gets to you. The cars are clean and nice. They often offer you bottled water. When you arrive at your destination, you don't have to fumble with cash or a credit card. They charge you direct to your card straight from the app. Tip is included. It makes taking a "taxi" ride so much better. The experience of it blows every other service out of the water. Again, they focus on the consumer experience here. 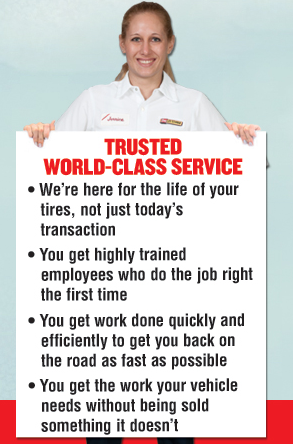 Something that Les Schwab doesn't do more than the "norm". The "norm" isn't enough now. You need to be excellent. As an aside: I got the tires put on at my normal dealership. They did it for a price 40% less than Les Schwab. In 30 minutes.